Various types of salt-tolerant plant species (trees or shrubs) that occur in intertidal zones of tropical and subtropical sheltered coastlines. The term is applied to both the individual plant and the broader ecosystem. Mangroves are trees or large shrubs which grow within the intertidal zone in tropical and subtropical regions and have special adaptations to survive in this environment. Mangrove is in fact a general name for several species of plant which can survive in saline environments. The adaptation has arisen in a number of different families of plants, therefore the general description of mangrove can be applied to a number of different trees, shrubs and even a palm tree and a ground fern. The term mangrove is applied to both the individual plant and the ecosystem, although an area of mangrove habitat is also called mangal 1. Mangroves are tropical species generally found on sheltered coastlines and estuaries. They are generally distributed above and below the equator, between the 20°C isotherms. This distribution is locally extended by warm sea currents and decreased by cold ones; mangroves are also sensitive to below zero temperatures and damaged by storms. At colder latitudes, mangroves are often replaced by saltmarsh 2. Although mangroves are widely distributed in 123 tropical and sub-tropical nations and territories, they are in fact rare at the global scale, covering less than 1% of all tropical forests worldwide 1. Mangroves are halophytes: this means that they have evolved mechanisms for salt resistance. There are very few marine ecosystems dominated by plants, but mangroves are one of them. Mangroves provide important foraging grounds and habitats for both marine and terrestrial fauna 2. Two limiting factors in the distribution of plants generally is the salinity and waterlogged sediment 2. To cope with the high salinity, mangrove species have a number of mechanisms to remove or exclude salt from their tissues, and certain species have evolved the ability to actively secrete salt from their leaves. The waterlogged, anaerobic soil provides another challenge which has been overcome through the development of aerial roots to transport oxygen to roots which are underground or underwater 1. Mangroves provide habitats for a vast variety of species. One reason for this is the diversity of habitat structure provided by mangrove, at the boundary between the land and the sea. The tree includes conventional above-ground tree and canopy habitat, and root structures within the soil or sediment, but additional habitat is provided by complex root structures above the soil which are often submerged by seawater. In some cases, these underwater roots support other species such as algae, oysters and sponges which grow on the root surfaces, further increasing the available habitat niches 2. Mangrove ecosystems provide considerable benefits to surrounding habitats and communities, both locally and at a wider scale. Their proximity to the coastline make them efficient water filters, improving water quality and protecting habitats, such as coral reefs, from siltation, whilst also protecting coastlines from erosion, providing soil stabilisation and storm protection 9. Mangroves provide a home and nursery grounds to a rich and complex array of species 10. Nursery grounds provide often complex habitats with protective areas out of reach from larger predators, where the juvenile fish grow large enough to then survive in the open waters. Many commercial fish species are known to rely on mangroves as juveniles, and also as adults for their feeding grounds 11. In terms of economic value, mangroves provide huge benefits. The total economic values for mangrove habitats hence range from US$ 2,772 ha-1yr-1 up to as much as US$ 80,334 ha-1yr-1 (average US$ 28,662 ha-1yr-1) 12. The forests are an essential resource for coastal human communities, providing fish, molluscs and crustaceans for trade and consumption and materials such as fuel, timber, honey, medicines and fodder. In a review of values for different types of ecosystem services, the economic values of forestry, fisheries and tourism ranked highly 12. Storm protection provided by mangroves is also very important, as demonstrated by one case study on storm protection benefits measured in economic terms following a cyclone in India. 13 In villages protected by an embankment without mangroves, the economic losses were over four times greater than in those with mangroves as their sole form of protection 13. 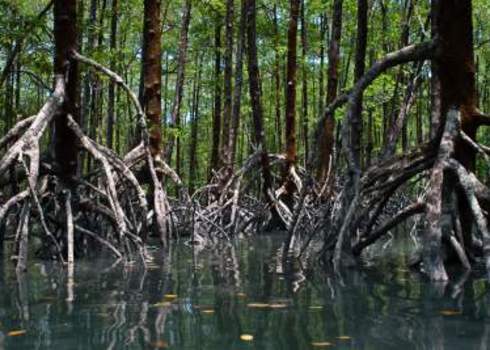 The ability of mangroves to sequester and store huge amounts of carbon plays an important role in global carbon budgets and in the process of mitigating climate change 14. Mangroves are recognised as one of the three key ‘blue carbon’ habitats and are among the most carbon-rich forests in the tropics. They are able to sequester 6 to 8 tonnes of carbon dioxide equivalent per hectare per year 9. These rates are about two to four times greater than rates observed in mature tropical forests 17. Over the last century, there has been extensive loss and degradation of mangrove habitats due to coastal development, pollution, aquaculture, and logging for timber and fuel wood. As a result, 20% of the total area of mangroves was lost between 1980 and 2005 1, 16 and mangrove habitat continues to decline at an estimated rate of 1-2% annually 17. Of the remaining mangrove stands, it is estimated that 52% are degraded due to shrimp/fish culture, 26% due to forest use, and 11% due to freshwater diversion 18. As a result, mangroves and the species that depend on them are at an elevated risk of extinction. At the present rate of loss, the world faces a real risk of losing the services provided by mangroves entirely in the next 100 years 19. Of the 70 true mangrove species, three are Endangered, and two Critically Endangered 4, 20. The species that are dependent on mangroves are also at risk. At least 40% of the animal species that are restricted to mangrove habitat are at elevated risk of extinction due to extensive habitat loss 21. For example, the pygmy three-toed sloth (Bradypus pygmaeus), endemic to a small island of Panama, feeds primarily on mangrove leaves and is listed as Critically Endangered due to the loss red mangrove forest and their small range 4. The loss of the mangrove habitats also affects the local communities who depend on them, either directly or indirectly. Spalding, M. D., Kainuma, M. & Collins, L. World atlas of mangroves. 319 pp. (Earthscan, 2010). Kaiser, M. J. et al. Marine ecology: processes, systems, and impacts. (Oxford University Press, 2005). Gaos, A. R. et al. Shifting the life-history paradigm: discovery of novel habitat use by hawksbill turtles. Biol. Lett. 8, 54–6 (2012). Gopal, B. & Chauhan, M. Biodiversity and its conservation in the Sundarban Mangrove Ecosystem. Aquat. Sci. 68, 338–354 (2006). Kirby, J. S. et al. Key conservation issues for migratory land- and waterbird species on the world’s major flyways. Bird Conserv. Int. S49–S73 (2008). Partnership for the East Australian Flyway. Mangrove Alliance. What are mangroves? (2013). Murray, B. C., Pendleton, L., Jenkins, A. & Silfleet, S. Green payments for blue carbon economic incentives for protecting threatened coastal habitats. Nicholas Institute Report NI R 11-04. 50 pp. (2011). Nagelkerken, I. et al. How important are mangroves and seagrass beds for coral-reef fish? The nursery hypothesis tested on an island scale. Mar. Ecol. Prog. Ser. 244, 299–305 (2002). Aburto-Oropeza, O. et al. Mangroves in the Gulf of California increase fishery yields. Proc. Natl. Acad. Sci. U. S. A. 105, 10456–9 (2008). Salem, M. E. & Mercer, D. E. The Economic Value of Mangroves: A Meta-Analysis. Sustainability 4, 359–383 (2012). Barbier, E. et al. The value of estuarine and coastal ecosystem services. Ecol. Soc. Am. 81, 169–193 (2011). Herr, D., Pidgeon, E. & Laffoley, D. Blue Carbon Policy Framework: Based on the discussion of the International Blue Carbon Policy Working Group. (IUCN & Conservation International, 2012). Crooks, S., Herr, D., Tamelander, T., Laffoley, D. & Vandever, J. Mitigating climate change through restoration and management of coastal wetlands and near-shore marine ecosystems. Challenges and opportunities. Environment Department Paper 121. 69 pp. (World Bank, 2011). FAO. Status and trends in mangrove area extent world-wide. By Wilkie ML and Fortuna S. Forest Resources Assessment Working Paper No. 63. (Forest Resources Division of the Food and Agricultural Organization of the United Nations, 2003). Valiela, I., Bowen, J. L. & York, J. K. Mangrove Forests: One of the World’s Threatened Major Tropical Environments. Bioscience 51, 807 (2001). Duke, N. C. et al. A world without mangroves? Science. 317, 41–42 (2007). Polidoro, B. A. et al. The loss of species: mangrove extinction risk and geographic areas of global concern. PLoS One 5, e10095 (2010). Luther, D. A. & Greenberg, R. Mangroves: a global perspective on the evolution and conservation of their terrestrial vertebrates. Bioscience 59, 602–612 (2009).